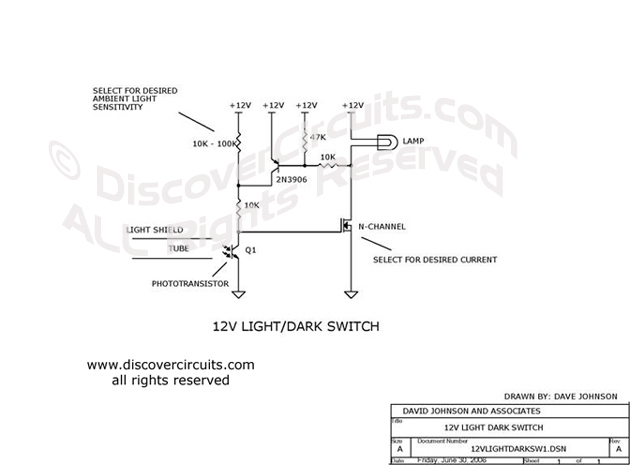 Circuit: 12v Light/Dark Lamp Switch__ Circuit designed by David A. Johnson, P.E. into 500+ categories. We have searched the web to help you find quick design ideas. We make every effort to link to original material posted by the designer. Please let us if you would like us to link to or post your design. Circuits designed by David Johnson, P.E. Text & Graphics Copyright © David A. Johnson, P. E. -- ALL Rights Reserved. LINKING to Dave's circuits is permitted but DO NOT COPY to your WEB SITE server! At night, this circuit will route current to a 12v lamp, turning it on. Copyright January, 1998 - December, 2017 David A. Johnson & Associates. All Rights reserved. Linking is ALLOWED but COPYING any content or graphics to your web site is EXPRESSLY PROHIBITED.